Real Madrid forward Cristiano Ronaldo was named La Liga's best player among a hat-trick of awards he won at the Spanish top flight's annual gala. 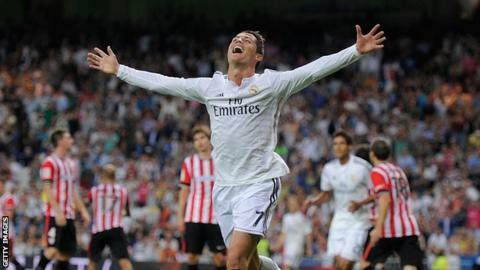 It is the first time Ronaldo, 29, has beaten Barcelona's Lionel Messi to La Liga's top prize. The Portuguese also won prizes for the league's best striker and best goal, for his back-heel against Valencia. "It is a very good moment in my career," Ronaldo said, later tweeting he was "happy and proud". The accolade comes as Ronaldo was also named on the shortlist for the 2014 Ballon d'Or, the award given to the world's best player. Argentina forward Messi, who also figures on the Ballon d'Or shortlist, had won all five previous La Liga best player awards since the prize was launched in the 2008-09 season. Ronaldo finished top scorer in La Liga in 2013-14 with 31 goals, but was unable to fire Real Madrid to the title, with city rivals Atletico winning the league. However, Real dominated the individual awards at the La Liga gala, with Sergio Ramos being named best defender and Luka Modric winning the prize for best defensive midfielder. Read more on Real Madrid v Barcelona: Has Ronaldo overtaken Messi?